A high-definition image quality is crucial to monitoring your home when you’re away. 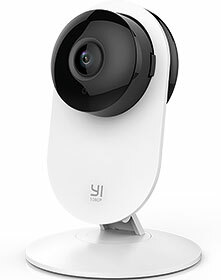 The YI 1080p Home Camera 2 is powered by a new generation Ambarella S2LM chipset, low-power 28 nm CMOS sensor, integrated ARM Cortex-A9 CPU, and H.264 HP 5.1 encoding technology. The F2.0 large aperture with six layers of optical lens provides true clear and bright pictures during both day and night time. Typically, home cameras are placed in a corner of the room where it could optimise the viewing angle. When the camera’s field of view is small, part of the room would be left uncovered. YI 1080p Home Camera 2 sports a 130° ultra-wide-angle to maximise the field of view. Proprietary Smart HDR technology dynamically calibrates and balances the exposure to achieve brighter and clearer images, full of details and vivid colour. Additionally, with the YI Smart Home Static Camera, all your videos are encrypted before being uploaded to the YI cloud, preventing critical data being lost or tampered with. The encryption key is updated periodically for the highest-level of data protection. • Baby crying detection and motion detection send alerts to your phone using the Activity Alerts feature. • Supports YI Cloud to avoid the risk of losing footage from an memory card. • Reliable Wi-Fi connectivity to access your camera with YI Home App on mobile device, and YI Home App on PC at anytime, anywhere. • Image encoding: H.264 High Profile. • Enhancement: 3D Noise Reduction. • Supported platforms: Android, iOS.